Magnolias when opening spread their petals out as if it was a queenly robe that they wanted to wear! One on our big tree was near enough for me to shoot. 1. Going to have Xmas dinner and Xmas night at a remote 19century Coaching Inn. 2. Its in the middle of a high country pass so hope our 4x4 can get to it! 3. Thinking about all the very different Christmases around the world that 365 friends are about to have! Lovely soft processing. There will certainly be different celebrations.....while the northern hemisphere rug up against the cold, we'll be picnicking on the beach! beautiful flower....that's good thoughts about the different celebrations around the world! magnolia is a beautiful flower, for sure. i like this shot, it's almost demure. enjoy your celebration and a merry Christmas to you and your family, maggiemae. Beautiful shot! I like your thought about the different Christmas celebrations we have. My husband, son and I ares spending Christmas in a different way than usual. We will take our gifts to my mother's nursing home and eat lunch with her there. This is much different than our celebrations in the past. May you have a great Christmas celebration at the inn. @daisy This is so thoughtful of you and your family! Will mean a lot to your mother! Beautiful flower! Lovely shot! Your Christmas sounds really interesting - safe journey and hope you get there ok! It really is wonderful to think about all the different Christmases around the 365 world. Amazing to see the different extremes if weather! Hope yours is s good one Maggiemae! Best wishes to you and your family! @pamknowler Thank you for your Christmas wishes, Pam - so nice to read! Fantastic mental image to go with your capture. Magnolias are truly one of the most lovely smelling flowers!! Beautiful shot, and yes, quite queenly! a gorgeous shot of this beautiful flower. Enjoy your Christmas up on the mountain! Hope all goes well. It's good to see all the different Christmas scenes around the globe on this site. A stunning close up, love all the detail! Fav! 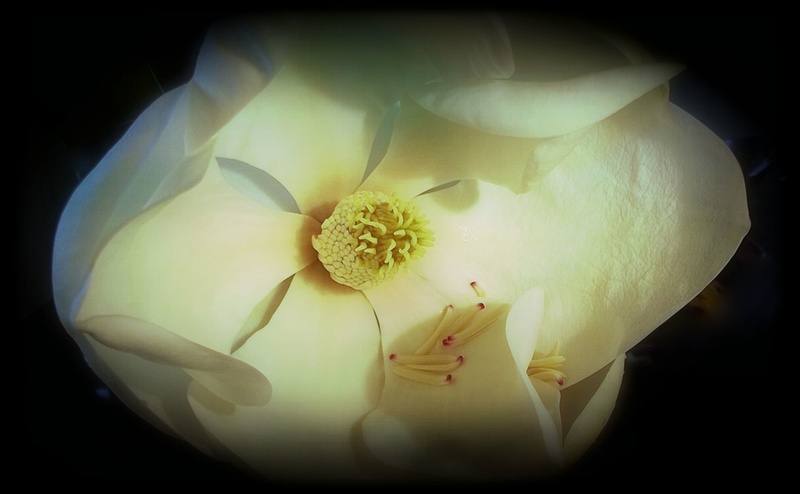 I love your description of this beautiful magnolia and how you captured it bathed in the light. Your Christmas at the old inn sounds perfect....enjoy. We'll be at my daughter's home about 2 hrs away with the whole family. All of us bring a special dish to add to her holiday ham. Wishing you and your hubby a very Merry Christmas! Happy Christmas, Maggie - hope you, your family and friends have a great time. I so agree with #3 maggiemae...if nothing else 365 shows us how the world lives! Enjoy your Christmas meal....you are starting your day already so have a good one. A very Happy Christmas to you & John. Nice capture and look! Hope your trek was successful! Merry Christmas! @mikegifford thank you Mike! Am posting from there with this message so all is not 19century! I love the way this looks as though you have spotlighted this opening. Just lovely and very FAV worthy! What a lovely flower. Great focus and detail.